My kids have recently found a huge love for Lego and I am so happy they are now at an age where they can use Lego to build and enjoy. Me and my brother used to play Lego for hours at a time, using our imagination to build all sorts of things. Lego is even cooler today and they have playsets for so many different franchises including all the things my kids love, DC Superheroes, Marvel and Star Wars. Gracie loves DC Superhero Girls. She has all of the action figures and the series incorporates all of her favourite female DC Characters. She was so excited when she spotted a picture of the DC Superhero Girls Lego before the release and we had been waiting eagerly for it's release. The range consists of Superhero High School (41232), Wonder Woman Dorm (41235), BumbleBee Helicopter (41234), Lashina Tank (41233), Harley Quinn To The Rescue (41231) and Batgirl Batjet Chase (41230). 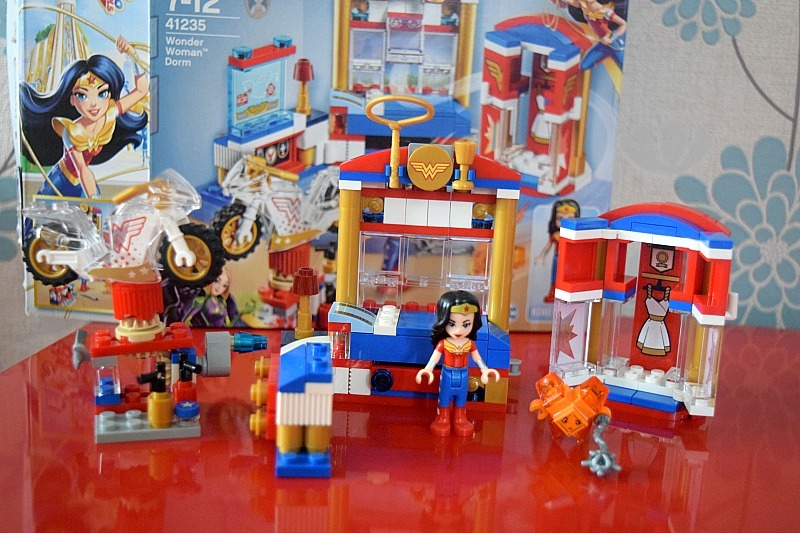 Gracie was sent two sets to review the first one being Wonder Woman Dorm. 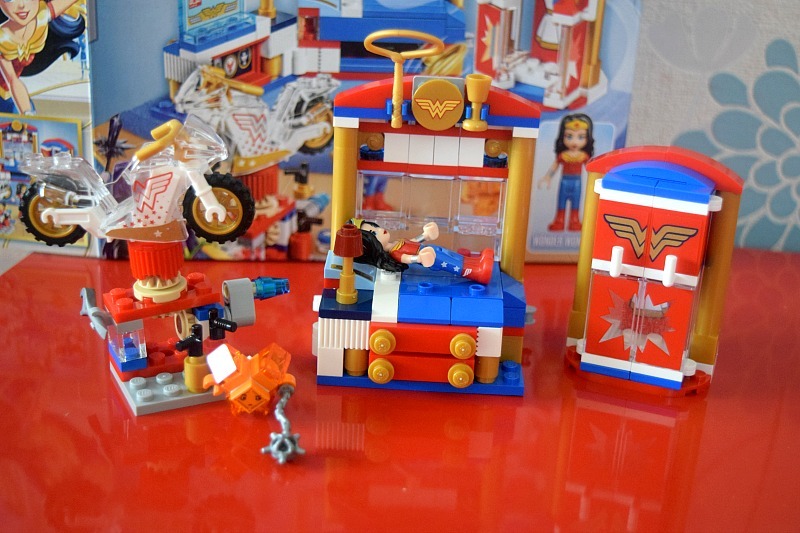 This set includes all the pieces you need to recreate Wonder Woman's Dorm room at Super Hero High along with a Wonder Woman minifigure, her 'invisible' motorbike and a naughty little Kryptomite. 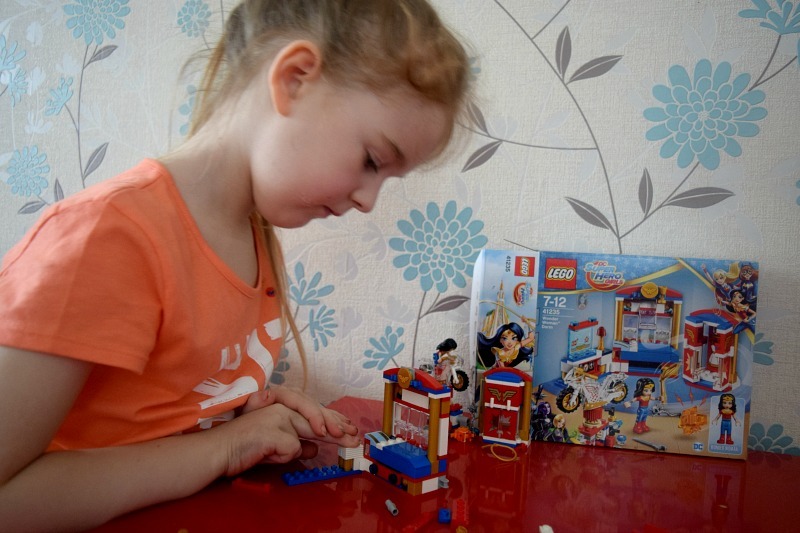 The set is aimed for children aged 7-12 years but Gracie did it all by herself following the step by step guide in the booklet. She only needed help with the motorcycle stand which was a little bit fiddly but she was so proud of herself. The set itself is so good. The motorcycle stand has a lever that you can use to turn the motorbike and tools for her to use to fix it. The wardrobe is big enough for Wonder Woman to stand inside for an outfit change. The bed and drawers also fold into each other and looks great both ways. Not only that, Gracie discovered one of the windows opens so Wonder Woman can sneak out in case of emergency! It certainly sparks her imagination. Gracie said her favourite parts are the wardrobe and the bed. She said 'You can hide Wonder Woman in the wardrobe from the Kryptomite and make her go to sleep on the bed'. She loves that you can take the motorbike off the stand and Wonder Woman can actually ride it. She really enjoyed building the set as well as playing with it and can't wait to show everyone her Batgirl Batjet next! You can shop the Lego DC Superhero Girls range now at Toys R Us or buy online on Amazon.